Ahh the mighty Macaroon. They have thwarted many a confectionaire, but no more. Our Chefs here in London have designed THE class that will teach you how to make these delicate confections, achieving perfect results every time. Their pretty colours and endless selection of fillings mean they not only look great, but will taste delicious too. Classes last an intense and fulfilling two hours. 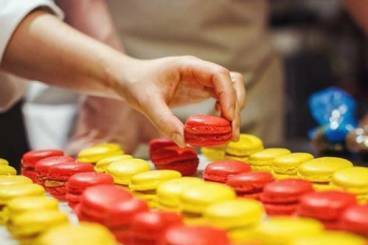 As well as learning how to master those tricky macaroon shells, you’ll also learn to create four decadent fillings. Our Chef will guide you through the mixing, drying and baking of the shells, talking through potential pitfalls you might experience at each stage. The specific fillings you’ll make will vary from class to class (you will be able to choose between two sets of four fillings), but buttercreams, ganaches, crème patissières and caramels will always be covered. Once you have created, filled and assembled your lovely macaroons, they are ready to be tasted (or devoured!) You’ll have plenty left to take home and share, armed with the expert knowledge you need to make perfect macaroons at home. We’ll email you the recipes you created and provide you with a macaroon fact sheet to take with you. You’ll be armed with the knowledge to recreate them at home as well as the confidence to experiment with new flavours and fillings.